Keene is one of the larger communities in Cheshire County New Hampshire with a population of over 20,000 residents. The City of Keene is home to a number of businesses both large and small including yours truly, Paragon. When we discovered Keene was searching for a new website, we were happy to offer help with an upgrade. We knew our website development team could craft the perfect site for the city. The City of Keene had a Drupal 6 website that was considered cutting-edge back in 2008. The expectations for websites have since risen significantly and the Drupal 6 site was no longer meeting today’s current standards. Even worse, this older version of Drupal was no longer receiving security updates, putting the city website at risk. 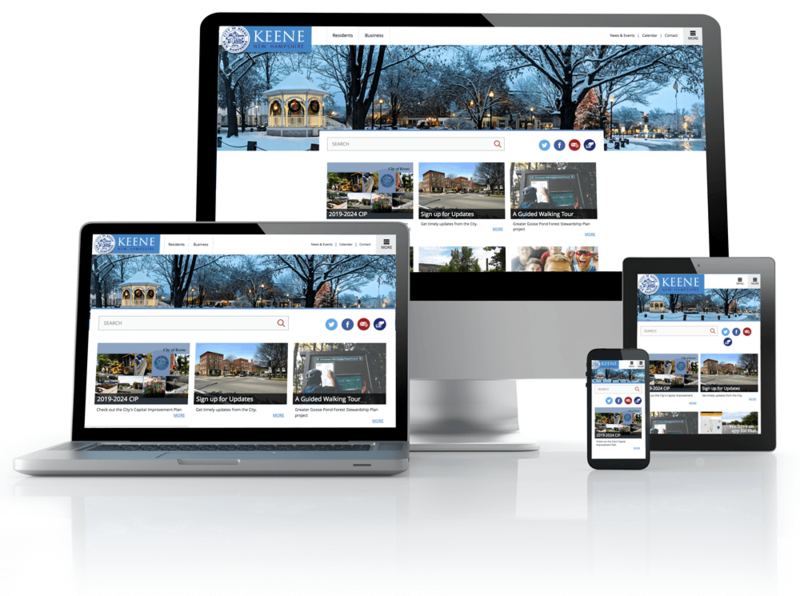 The City of Keene wanted to develop a web resource that would be user-friendly for residents, businesses, and visitors that allowed them to find any information they may need. We began by purging and cleaning out older content that was no longer relevant or being used by the municipality. Utilizing website analytics data, we were able to see which pages were no longer needed and could be deleted. The City of Keene website needed to be accessible to local officials who used the site regularly to do their jobs, to residents looking for local resources, and to visitors as well. To be sure the site was meeting these needs, Paragon conducted keyword research and implemented the results to help the functionality of the website and improve the City of Keene’s Search Engine Ranking. As with all Paragon websites, the user experience is always a priority. Now, the City of Keene once again has a cutting-edge website with Drupal 8 that will be supported by the Drupal Community for many years to come. They are able to showcase images of Keene on all of their pages to keep users interested and engaged. The City will be able to post and maintain information in a timely and organized manner to meet the needs of both residents and visitors. The new website is so clean and easy to use. The old website had so many options that I could barely find what I was looking for. Now the new layout is straightforward, and I can get what I need in just a few clicks. Plus, the images of Keene are wonderful and really illustrate the community well.